Public Health Nutrition in Developing Countries focuses on application of public health and nutrition sciences for formulating strategies and actions for preventing and solving the serious problem of malnutrition in developing countries. 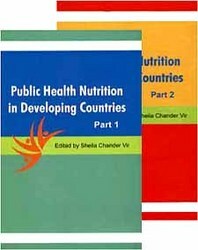 This book presents an update on public health nutrition problems of developing countries along with a description of approaches used and efficacy of trials undertaken for addressing them. The book will be a very useful reference not only for nutritionists and public health specialist but also for pediatricians, development professionals, programmers and international agencies. It should be of interest to politicians, policy makers, bureaucrats, economists and agriculture scientists.